You won’t believe how tasty and amazingly aromatic these muffins are until you try them at school, at work, at breakfast! Preheat oven at 175οC/fan. In a non-stick frying pan heat 1 tbsp oil on medium heat and cook onion until translucent. Stir in sun-dried tomato and dried thyme. In a bowl beat eggs with remaining oil and yogurt. Stir in flour and baking powder, ketchup, tomato juice until well combined. Stir in all cheese, onion and sun-dried tomato, fresh thyme and paprika. Brush with oil 12 muffin cases and divide your mixture there. Bake for 35 minutes. Whizz all mousse ingredients and transfer in a piping bag. Fridge until needed. 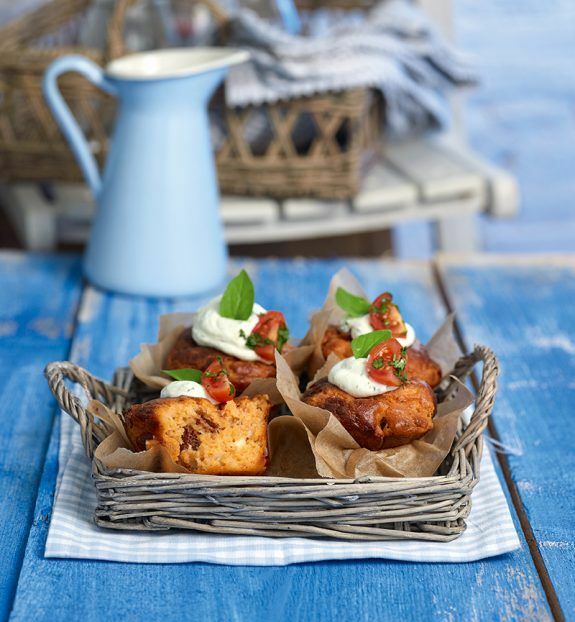 Allow your muffins to cool a little and serve warm garnishing with cheese mousse, a cherry tomato and a fresh basil leaf on top.